using the brewery’s new equipment. There might have been a time when drinking beer out of a can was looked down upon. Cans were for budget beer. Cans gave your beer a tinny flavor. Cans make you go blind. OK, maybe not that last one, but there was definitely a stigma against the cylinder in the world of beer snobs. But fear not, aluminum providers of the world, cans are back and back with a vengeance. CraftCans.com – a national group that supports the “Canned Beer Revolution” – counts more than a thousand canned beers in the United States from over 300 breweries, and there’s bound to be more (at least a couple, since there’s some local brews missing). That ‘revolution’ word may not be an overstatement. This push comes on the heels of a craft beer movement that has been rocking the United States as more and more craft beer makers open breweries and find success. 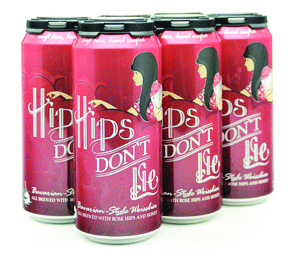 Locally, a number of breweries have turned to cans as their main distribution method. Lucette Brewing out of Menomonie has three canned beers in their repertoire now, including their Farmer’s Daughter Spiced Blonde, Ride Again and, their newest, Hips Don’t Lie. Michael Wilson, a cofounder at Lucette, said cans were an easy choice for them. “The most important thing to us is the quality of our beer, and with that in mind the best possible package for beer is a can,” Wilson said. The two worst things for beer are light and oxygen, and Wilson said cans help protect the product better than glass could. Obviously light can get through glass and not through the can, but with oxygen, the crown or cap on a bottle or growler doesn’t hold as tightly as a closed can. But what about all that nasty tinny flavor, Michael? What about that? Wilson said the technology has come plenty far and with today’s liners you don’t have to worry about any residue. Though, the best way to drink beer is still to pour it into a glass. Newer to the canning game is Eau Claire’s Lazy Monk Brewing. The relatively new brewery has been found in growlers around the state, but have begun to can their Bohemian Pilsner in 16oz 4-packs. A growler and a 4-pack conveniently add up to the same amount of the good stuff. Lazy Monk founder Leos Frank said they designed their cans with simplicity in mind, with their illustration of the Lazy Monk over a gold background. And while cans are certainly on the rise, the vessel is still vastly outnumbered by bottles, which gives canned beers a unique draw to people trying to parse their way through their hundreds of options at big beer retailers. In those special can cases around the area, you can also find cans of Northwoods’ brews (including Walter’s and Floppin’ Crappie) and, of course, plenty of Leinies. So while the revolution may not be televised, locally, it’ll probably be canned.